Among the calls of condolences, family members who have lost a loved one often are disturbed by a far less welcome call: that of collection agencies seeking payment of the deceaseds past due debt. While survivors legally are obligated to pay only if they co-signed on a loan, car payment, mortgage or other debt, that wont stop the agencies from going after heirs. One ploy agencies use to guilt heirs into coughing up the money is to bargain with them and discount the debt by 40 to 60 percent. The agency tells the heirs that if they pay the remaining amount, the agency will leave them alone. And it can be very effective. Emmett recommends heirs write the agency a letter documenting that they are not personally liable for the debt and not to contact them anymore. If the agency continues to contact the person, it is in violation of the Fair Debt Collection Practices Act. The act was established in 1978 to protect consumers from abusive debt-collection practices. As baby boomers age, they are accruing more debt, and a good portion of people have no intention of paying it off before they die. Nearly 40 percent of seniors in a recent survey by CESI Debt Solutions said they had accumulated debt in their retirement years, and they had no plan to pay it off during their lifetime. Heirs may not be liable for the debt, but the deceaseds debt doesnt go away when they die, and heirs could be responsible for it should they take on the mortgage of a vacated home. If someone wants to inherit the family home with a lien on it, the heir inherits that lien along with the home. The heir can refinance the home or, in some cases, keep making payments on the existing loan, said David Fountain, a mortgage consultant for Wells Fargo. If no one wants to keep the home or pay the loan, the mortgage company will foreclose on the property. It wont show up on a credit report, but if they want to keep the house or keep the equity in the house, then theyre going to be interested in making the payments so the home isnt foreclosed upon, Fountain said. The deceaseds estate is responsible for paying off the persons debt, and the bills have to be paid before any inheritance goes to heirs. 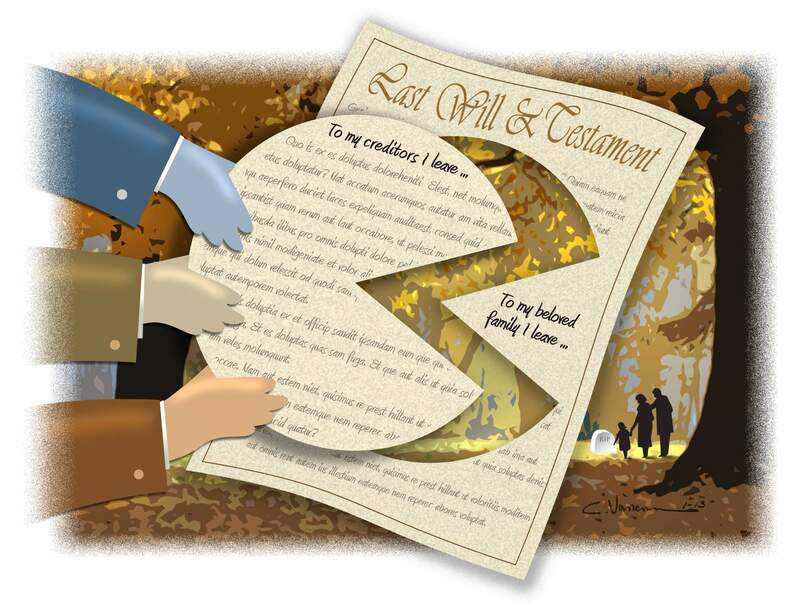 The estate goes into probate, and the executor of the estate  typically an attorney or an appointed family member  is responsible for collecting the deceaseds assets and making sure creditors are paid. The executor typically will put a Notice to Creditors in the newspaper asking creditors to present their claims. If the executor already knows of the debt, he or she will contact the creditors and settle the claim directly. Creditors have until four months after the first Notice to Creditors is published in the paper or one year from the day of the persons death, whichever comes first, said Geoffrey Craig, a Durango estate attorney. If there is not enough money in the estate to pay off the creditors, the estate is considered insolvent. Creditors can try to settle for less money than they are owed, but the rest of the debt will disappear. Regardless of heirs responsibility to pay, it still is a good idea for families to discuss what debt exists and who it belongs to so family members can ward off creditors and are not surprised to see a lien on the family home. I think its a conversation that families really do need to have, and as their members become older, its more important to have those conversations so people do understand the financial situation and what the options are, said Julie Cooley, vice president of First National Bank of Durangos Mortgage Department.